3D Cellular's Advance OSS is an Operational Support System that makes it easier than ever before to manage network elements from multiple vendors. Advance OSS for Ribbon Virtual Session Routers and Virtual Session Border Controllers provides Configuration Management support for unlimited numbers of network elements along with features to support Fault Management and Hardware Inventory. Advance OSS provides mobile network engineers with a powerful set of features to manage Ribbon Virtual SR-SBC configuration. Audits and consistency checks help to maintain optimal configuration, while boosting engineering productivity with automated procedures. Small or large scale configuration changes can be made safely and securely, with maximum efficiency. The intuitive user-interface simplifies many complex tasks, allowing every engineer to be as good as your best. Built using the input and experience of countless engineers in the field, Advance OSS is currently in use with Ribbon Virtual SRs and SBCs throughout the USA. Advance OSS supports multiple network elements from multiple vendors. It scales to work with any number of Ribbon Virtual SRs and SBCs. The solution consists of two applications that work together: a fast, feature-rich desktop client and a powerful server-side admin station. Advance OSS Server: The Advance OSS Server provides indispensable server-side automation. It can collect configuration data as well as perform scheduled audits and updates. Data is stored in a fast, always accessible database, which helps to reduce processor loads and network bandwidth for Ribbon Virtual SRs and SBCs. Data is always instantly available for Clients which saves valuable engineering time. Many tasks, including data collection, audits and script execution can be scheduled to run repeatedly, at any time. Advance OSS Client: The client provides a responsive and intuitive interface that simplifies and accelerates common or complex tasks. In contrast to many other client-side applications, this solution is optimized to bring you lightning fast access to data. The client can connect to the server to query data in real-time or Engineers can download data for their region and work offline. If required, the client can connect directly to Oracle network elements to collect data. Configuration changes can be executed immediately, or sent to the server to be executed at a scheduled time. Advance OSS is effortless to install and set-up. It automatically configures connection details for every required Ribbon Virtual SR and SBC, saving valuable engineering time. Advance OSS includes a number of features designed to ensure accurate routing using Golden Rules. These features were requested and extensively tested by engineers in the field. The program allows operators to define Golden Rules, a set of reference parameters, with a highly-flexible rule system that includes wildcards and lookup-tables. Engineers can use Golden Rules Comparison to automatically validate the configuration of Virtual SRs and SBCs that they are responsible for. 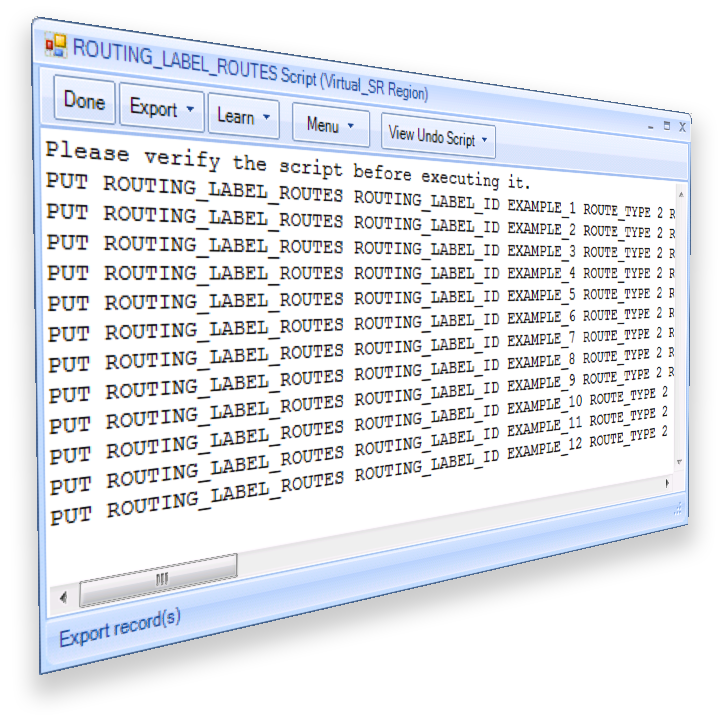 When the program finds discrepancies between the reference parameters and the actual configuration, corrective scripts can be automatically generated to update Virtual SR-SBCs. Mobile networks are complex, dynamic and fast changing which makes configuration projects challenging. The Trace Diagram feature allows you to design, create and edit your network configuration visually, so you can clearly see the relationship between configurations as you build them. This makes complex projects easier to handle and ensures greater accuracy. Editable Trace Diagrams show you the complete flow of relationships from start to end and let you change or add nodes as you go. 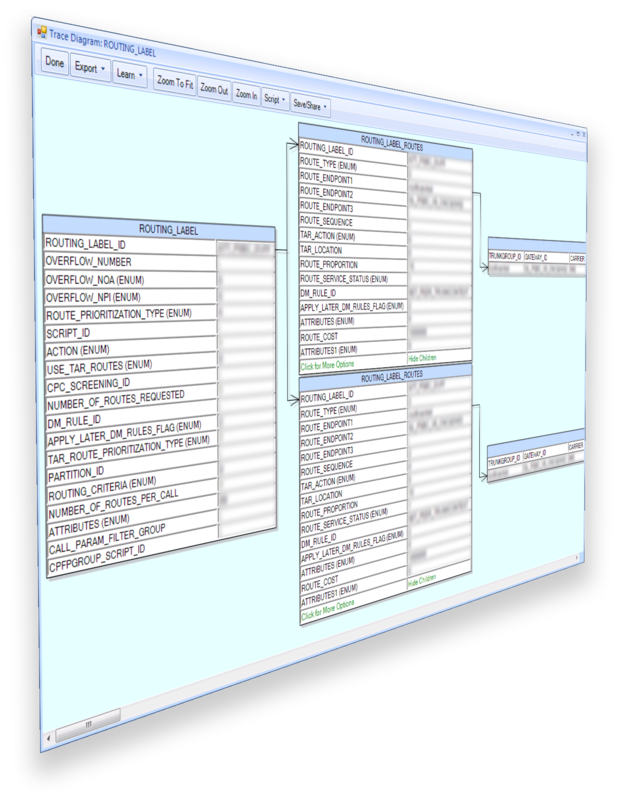 The program understands the relationships between tables and allows you to quickly navigate between them, as well as providing traceability between diagrams and tabular data views. Team collaboration is supported with on-demand reports. Configuration Management is at the heart of Advance OSS. Configuration data is automatically collected and is always instantly available to engineers without putting any strain on the network. Data can be viewed, queried, audited and even edited with intuitive, time-saving point-and-click controls. 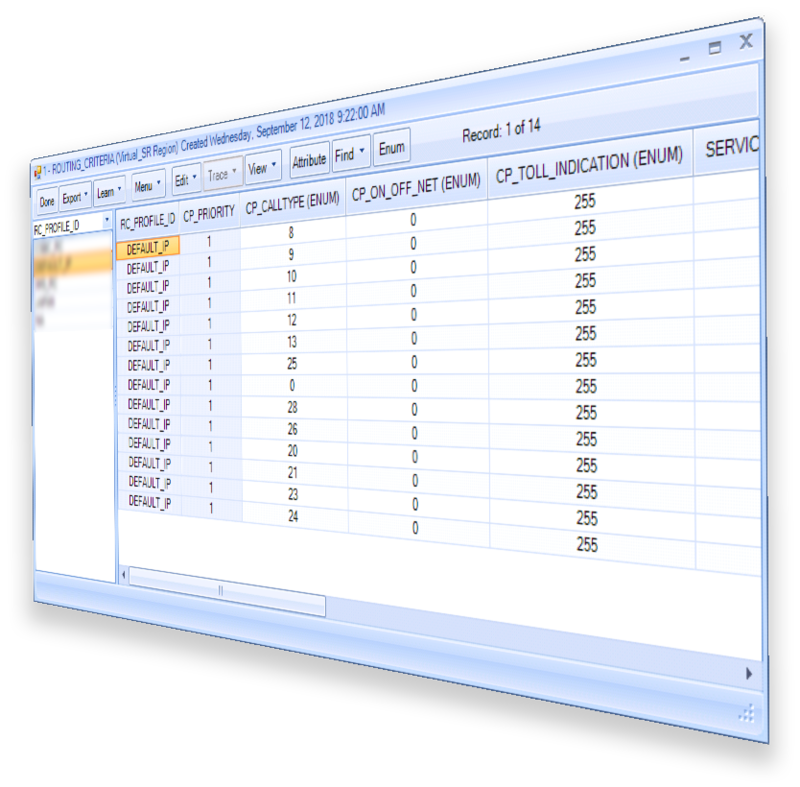 Configuration data can be easily edited for multiple Virtual SR-SBCs using a simple spreadsheet style window which is designed to minimize human error. Scripts are automatically generated which can be saved and shared with colleagues to be reviewed or modified before being executed. The program also allows engineers to upload edited configuration data to the server to retrieve later or share with other engineers. Advance OSS gives you total control over network elements, allowing you to safely connect directly to Ribbon Virtual SRs and SBCs to execute any required commands. Results are captured and can be viewed in the Advance OSS Client or shared with colleagues. Custom commands can be stored and executed automatically and, if needed, can be executed in 'superuser' mode. Advance OSS regularly checks the health of Ribbon Virtual SRs and SBCs and sends out a periodic System Health Check Report. This is a ‘dashboard’ report which includes high-priority alarms and other important information that may require corrective action. Advance OSS Server automatically creates configuration backups and safely stores them on the server. If required, engineers can also make backups on demand. When needed, configuration backups can be automatically or manually restored to roll-back Ribbon Virtual SRs or SBCs. 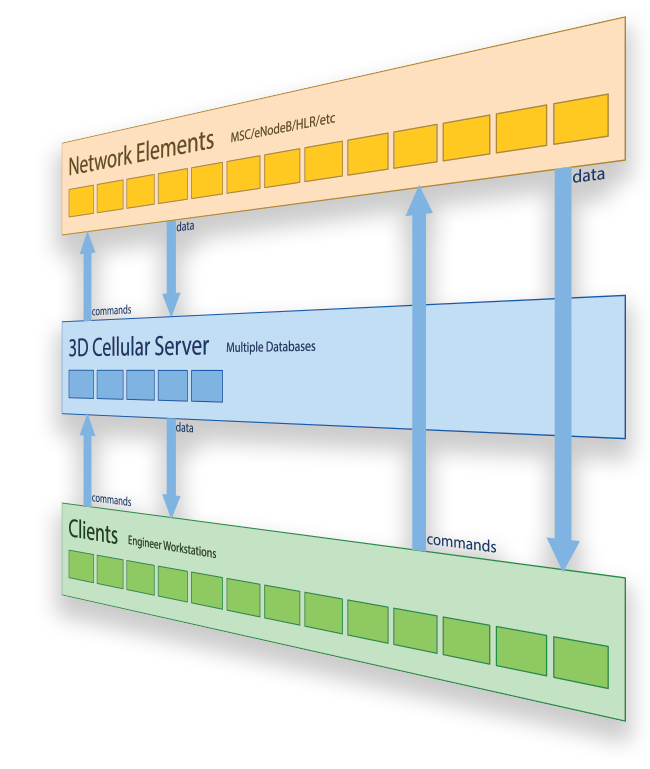 All 3D Cellular solutions share the same highly-praised, user-friendly interface, making it simple to work with multiple network elements from multiple vendors. Complex tasks are reduced to a few clicks and wizards help to accelerate learning with on-screen instructions. Massive amounts of data can be viewed in a clear and customizable spreadsheet-style view. Intuitive point-and-click query functions allow you to pinpoint and isolate the data you need in record time. 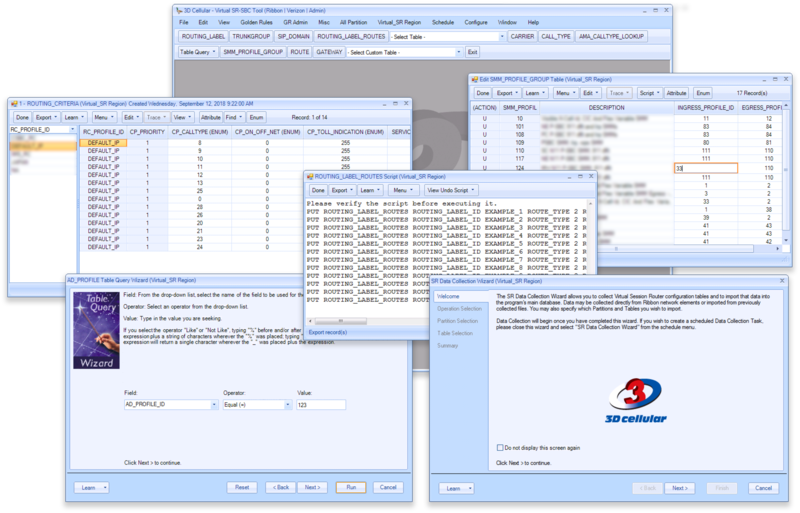 Powerful wizard assisted queries can be saved and used again for any Virtual SR or SBC, at any time. With just a few clicks, sophisticated reports can be created and shared with colleagues. Automated Golden Rule Reporting: Automatically receive detailed daily e-mail reports on configuration discrepancies with detailed results for Virtual SRs and SBCs in your area. Automatically Execute Commands on Multiple Virtual SR-SBCs (Coming Soon): Execute custom Ribbon Virtual SR-SBC commands and collect miscellaneous data on-demand. Automatic Periodic Health Check Reports (Coming Soon): Automatically receive Virtual SR-SBC system health check reports including CPU health, alarms, memory and more. Fully Automatic Data Collection: Ribbon Virtual SR-SBC automatically collects data, every day, making it always and instantly accessible to engineers. Scheduled or on-demand data collection can be performed for any number of Ribbon Virtual SR and SBC network elements. Automated Data Comparison (Coming Soon): Bulk comparison allows you to automatically compare selected fields in any number of Virtual SRs or SBCs, or even against historical data. Automatically Meet Vendor Software Updates: Advance OSS automatically detects Ribbon software updates and instantly re-configures itself to handle any changes. It supports multiple software versions simultaneously.